Copernicus - The largest crater in this photograph is Copernicus. The crater is 93 kilometers wide and about 4 kilometers deep. It is around 800 million years old - relatively young on the Moon. It has an interesting looking terraced inner wall and three central peaks, which can just be seen here. There is also a system of rays, which if you look carefully, you can see stretching well across the field of this picture. In the surroundings, the mountains seen above Copernicus are the Montes Carpatus, and a bit faded out to Copernicus's upper left are part of Montes Apenninus along with the crater Eratosthenes. 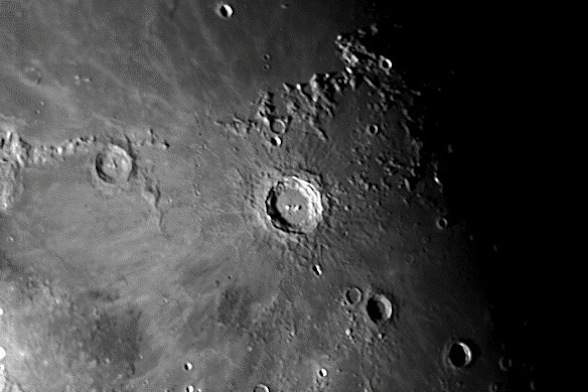 The two prominent craters below Copernicus are Reinhold (above), and Lansberg (below).